There's a Rogue Cyberman out there... no, not one which claims he has all the missing Doctor Who episodes in his dungeon, but one whose identity is a muddle. He appears all over the place but, strangely, is an enigma. Here's a little investigation into this oddity of the Doctor Who world and his many friends. The Cyber-race is a mongrel species. We have learnt in Doctor Who that they used spare parts to build replacement bodies, and that they often cannibalise whatever bits they can get their hands on to assemble new forces. It is fitting, therefore, that when there came a period in Doctor Who's history in which the Cybermen were banished from our screens, their fleeting appearances became peculiar and disorganised, as if they were clinging to survival and in disarray. After the The Invasion finished its run in December 1968, the Cybermen would not be seen again properly for over six years. Jon Pertwee had no battles with them at all. But in this period of near-extinction, there were still sightings of these metallic monsters. Tantalising reminders that they might still be out there in space - perhaps in unseen adventures. For such occasions, there were never any new costumes created and so the components became ever more mixed and increasingly damaged. When they were absent from the TV series, they were more like real Cybermen than ever - with cannibalised components and patched up with repairs. Then a strange thing happened. The official world of Doctor Who seemed to lose its memory. The hybrids took over, and ended up changing their own future. This is the story of the forgotten Cybermen of the early 70s, and their jumbled lives. During a recent showing of the Documentary series "Doctor Who Revisited", I noticed a slide popped up which was used to represent "The Cybermen" from the 1960s (see above right). I'd seen this photo before and it nagged at me because I knew it was not from a particular story. After racking my brain, I recalled the old BBC website had a Cyberman gallery. Sure enough, the photo was there. It was labelled simply as a publicity shot from 1967. Did this explain the mystery? At first glance it might seem to make sense. 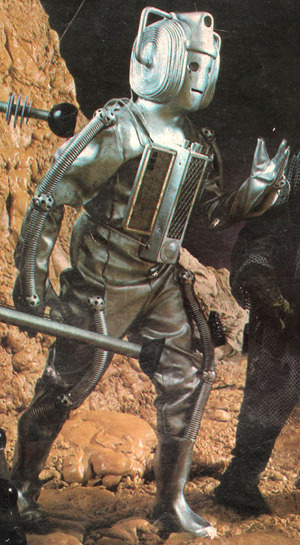 The suit is the type with thick tubing from Tomb of the Cybermen which was indeed a 1967 story, and the helmet is a similar style from a story in the same season - The Wheel in Space. But there was a problem. Two problems in fact. The chest unit pictured in this shot does not belong to either the head or the body. The chest unit is from The Invasion, which was made a season later than the other bits, and would have been built around August 1968. In fact, not even the helmet would be correctly dated to 1967 because The Wheel in Space was not in production until April 1968. So if the chest unit is the most modern component then not only is the date proved incorrect, but so is the logic behind this being a publicity shoot in the late 60s. The final episode of The Invasion was shown in December of 1968 and, even without the diligent Branding Department of the 21st century, there's no way they'd have done promotional photography with old Cybermen soon after they'd gleefully launched a new design. So 1969 suddenly doesn't look like a very likely year either. Aside from the combination of Tomb, Wheel and Invasion components, there is an extra bit of interest to this costume. 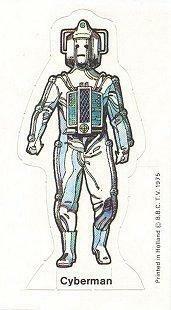 This Cyberman doesn't have an ordinary body - in a former life he was the Cybercontroller himself! The most obvious difference is an extra set of pipes down the rear of the legs however the controller costume also featured additional pipes across the collar bones. The use of the Controller body also explains why in the Mystery photo the chest unit is wrapped round the body with an elastic band - the Cyber Controller never had a chest unit, so there would have been no attachment points on the fabric. This makes the unit hang lower and adds to the unusual appearance as it becomes more like a "belly unit". So, if the likely date was after 1969 then could this be something to do with the publicity surrounded the appointment of a new Doctor the following year? Time to call for help. I asked the lovely Peter Ware at Doctor Who Magazine to see if he could shed any light on this photo. Mr Ware came up with the goods! He fished out a photograph from the archive which suddenly gave a hint towards what was going on. There were still things to be unravelled but it was a step in the right direction. 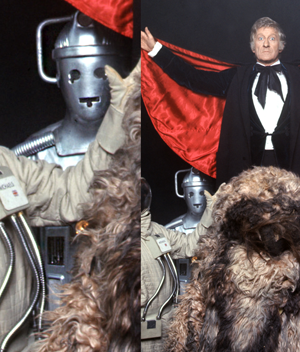 The image on the left shows Jon Pertwee in masterful pose surrounded by the monsters from his first season in Doctor Who, along with the very same Mystery Cyberman. Could it therefore be something to launch his tenure? Actually, no. There was another problem. Jon Pertwee had made his debut in the first week of January and the Radio Times had promoted it with a front cover at that time. Ambassadors of Death didn't start production until late-January 1970 and Doctor Who had such a tight turnaround that sets and costumes were rarely ready more than a week or two before shooting began. It was extremely unlikely that the Ambassador costume had been prepared in 1969 ready to go before the cameras at the end of January 1970. Then, the marvellous Gary Gillatt game to the rescue and connected the last of the dots. Mr Gillatt pointed out that the Mystery Cyberman photos were in the BBC Picture Library all grouped together with famous studio shots of the Ambassador and Silurian on their own. They were photographed at the same time - but not in January. The 7th May issue of the Radio Times had a behind-the-scenes feature showing four pages of info and photos entitled "Dr Who's Who." The opening montage for this feature was a collection of the studio shots, including that very Cyberman - pictured right. The Radio Times in the 21st century still arranges its own shoots of Doctor Who monsters and actors. These shoots are usually excellent and they freshen up the tired old BBC publicity images which get endlessly recycled across every piece of official merchandise. So it was now clear. Around April of 1970, the Radio Times was putting together an article on the programme to coincide with the start of Ambassadors of Death in May. To illustrate it they'd had various monsters brought from the costume stores and a series of good studio shots were taken. It seems fair to assume that in some corner of the costume department there was a rail filled with silver suits, and nearby there were various helmets and chest units on shelves. With so many costumes having been used in Tomb of the Cyberman, and a great deal more made in Invasion, there would have been quite some choice. The pieces of Cyberman costume that were brought together were: a helmet from Wheel in Space, a Chest Unit from The Invasion, and the suit of the Cybercontroller from Tomb of the Cybermen. These shots then made their way into the BBC Picture Library and since they were good-quality colour photos, they became more commonly used than any particular episodic ones. At some point someone must have glanced at this photo and incorrectly attributed it to Tomb of the Cybermen, resulting in the 1967 date on the website. The Radio Times unwittingly invented a new breed of Cyberman with a variety of components from different eras. I'm calling him Cyber-Variant RT70. The image of this creation was still being used 43 years later in a documentary for the 50th Anniversary. When I mentioned this curious Cyberman to my fellow researcher Jon Green, he came up with something else of interest which I'd forgotten. Although it wasn't necessarily directly connected, it was clearly part of the same story of these dormant costumes. 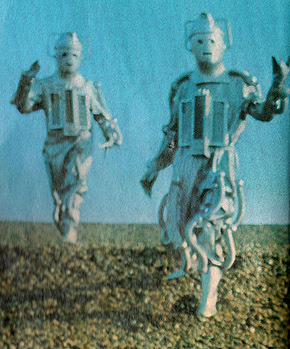 Jon recalled the 1973 Anniversary Radio Times special featured two Cybermen chasing Polly and Ben over a shingle beach. When I finally laid my hands on my copy, I was interested to see that yes indeed the same Mystery Costume had been used in the 1970 shoot but divided between two different Cybermen. 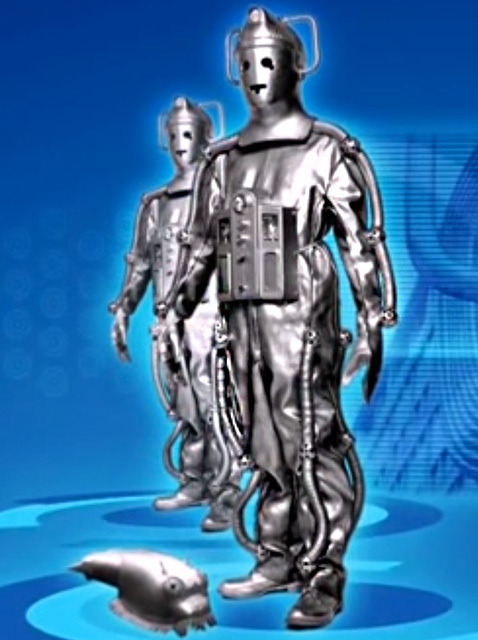 The Cyber controller's legs were on a Cyberman which had a Tomb style head, whilst the Wheel helmet was swapped to a costume with normal Tomb legs. But there was a difference to this new "design" (although design is too strong a word - perhaps "assembly" would be better). 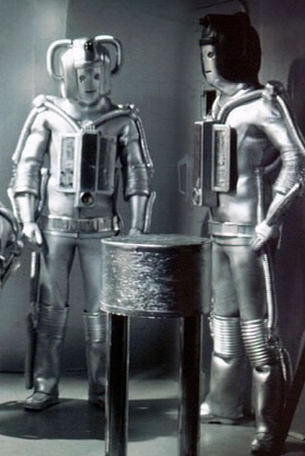 The chest units on both Cybermen were those from The Tomb of the Cybermen, not The Invasion as with the RT1970 shoot. Another minor difference was in the boots - returning to the Tomb style wellingtons, with the trousers and pipes tucked inside. The photos on the day were taken by Allan Ballard, a notable photographer who would go on to have a high profile career in music and fashion. For the 1973 Anniversary his images provided added quality to the special publication. He photographed a number of companions in interesting locations with a variety of old monster costumes. To capture the Cyberman shots, Ballard travelled to Norfolk early one morning to meet Michael Craze and Anneke Wills. They all went out to Cley Beach and Stiffkey Marshes and took numerous photos, of which only one photo made it into the final magazine. Unused shots show the monsters pursuing the Doctor's companions across the marsh and along the shoreline in the evening sun. They must have been very quick Cybermen to keep up with these young people as they ran! The photo used in the magazine shows the companions running towards the shoreline. It is a strange sight to see the second generation of Cybermen costumes in full colour in the 1970s, given that a third generation had been introduced before the end of the 60s. The narrow heads which featured on three occasions with Troughton are particularly distinctive. But that brings us to the matter of the next hybrid - the one on the rear cover of that very same magazine - and perhaps the most significant Cyberman ever cobbled together. Since the Radio Times was organising its own images for the cover, there was again no worry about adhering to any particular design. The result was another outfit which seems strangely familiar. 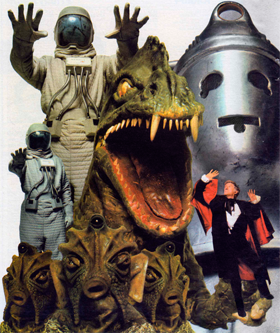 The Radio Times Special was set to commemorate ten years of Doctor Who and for the occasion a studio shoot was organised featuring a Sea Devil, a Cyberman and a Dalek. It seems likely that the shoot was arranged at the time pre-production was under way for Death to the Daleks which would begin shooting in November 1973. The costume which Jon Pertwee wears on the cover is the same as he would wear in Death to the Daleks. This may be a complete coincidence as he'd also worn it for a story many month earlier, but it seems reasonable to date this image to the end of October 1973. One thing we do know is that it can't have been taken any later than the 9th November because this was the time at which the Dalek props were repainted silver for the forthcoming TV appearance on Exxilon. 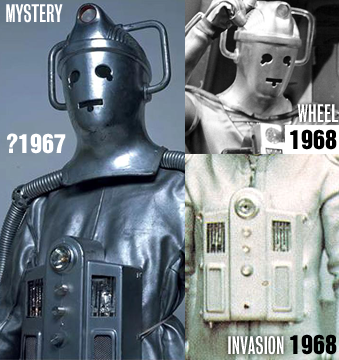 The bulk of the Cyberman costume is from The Moonbase as with the other hybrids but the head is from the most recent television serial: The Invasion. Although "recent" in this context means five years before the photo was taken! The difference in age between the body and head was only two years! Tom Baker was contracted to play the Fourth Doctor in February of 1974. Two months before he was even due to film his regeneration sequence at the end of Planet of the Spiders in April, the new incarnation of the Doctor came up against one of his old foes. On the 14th Feb 1974 there was a photocall in advance of contracts being signed that would confirm new Doctor. Tom Baker was wearing a curiously festive jumper but that's nothing compared to the eye-opening nature of the Cyberman assembled for the occasion. The body and head are taken from The Invasion but the chest unit is again taken from Tomb of the Cybermen. It is curious that, for whatever reason, not a single one of the newer Invasion chest units had been used in any of the promo photos taken since 1969. They always reverted back to the earlier design. Was this a purely aesthetic choice? Was there difficulty attaching them? Or had they vanished from storage? The most jarring thing about the arrangement of the costume is that the head seems to be floating above the neck. When the Invasion costumes were worn properly, the collar of the helmet sat under the wetsuit, to give the elements some cohesion. This costume also shows repairs had been carried out. The original rods connecting the body and the knees had gone and instead a length of flexible metal hose had been used. 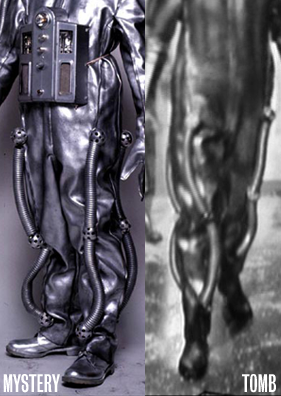 Strangest of all, the replacement link positions on the body were the balls used in the Moonbase/Tomb costumes. It makes you wonder what state other costumes were in if such spares were freely available. Not long after, in April 1974, the Doctor Who Exhibition opened in Blackpool and Doctor Who costumes that had been held in storage at the BBC were moved to public display. In one early photo pointed out by Gary Gillatt and taken by Stuart Glazebrook, the arm of a Moonbase/Tomb costume can be seen alongside Jon Pertwee. 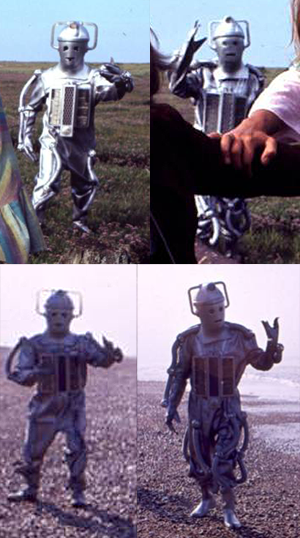 What's particularly interesting about the story of these hybrid costumes is it seems they were influential in the direction the canonical Cyberman went. The Radio Times cover shoot of October 1973 turned out to be the key to why these monsters took a step backwards in their evolution on screen. When Tom Baker took over, the last two TV appearances had been six years previously. The Wheel in Space and The Invasion costume designs introduced slimmer connecting rods on the arms and legs. The Invasion even had a completely new style of chest unit. By the end of the Troughton era, the Cyberman had moved on quite a lot from their Moonbase appearance. However, when production got underway for Revenge of the Cybermen, the bodies for the new costumes bore little resemblance to those in the most recent story, The Invasion. 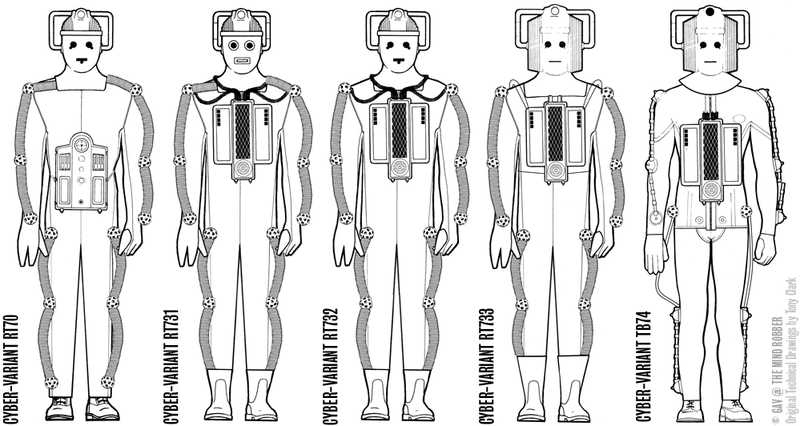 Gone were the new chest units and slimmed down joints, and both elements were reverted back to their appearance as they had last been seen in Tomb of the Cybermen. But, more importantly, with the mixture of the bigger helmet - they looked almost exactly the same as the Cyberman from the Radio Times cover photo! Even the loops of wire over the shoulders which were holding the chest unit in place seemed to have inspired extra piping down the front of the bodies of the new Revenge Cybermen. Revenge of the Cybermen was in production in the autumn of 1974 - only a year after the Radio Times issue had come out. This recent reference material seems to have strongly influenced what costume designer Prue Handley thought the Cybermen should look like. Whilst the Cybermen were off our screens for half a decade the sightings of them were fleeting. When pictures emerged they showed a set of costumes which were were deteriorating. It is fitting that when they returned to Doctor Who, the Fourth Doctor remarked on how they'd nearly been wiped out and became "a pathetic bunch". Their new design was a throwback to the past and the dialogue almost seemed to reflect that. Jon Green pointed out further evidence of the lasting legacy of the photo shoots featuring the hybrid costumes. 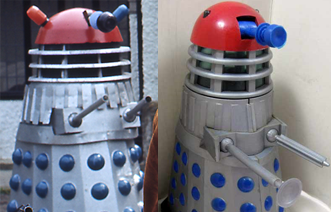 One of our fun branches of investigation during our Dalek props research was explaining how the Denys Fisher "Red Top" Dalek toy came to be made (on the right). It was clear that photos of one of Terry Nation's Daleks had been given to the toy-makers for reference. But Terry Nation's Daleks were non-standard. There was never any "Red Top" on TV - it was a jumble of movie props which had been repainted and reassembled in an odd way. The photos of Terry Nation and his strange "Red Top" Dalek were originally taken for the Radio Times 1973 Anniversary issue! You can read more about this investigation on the Dalek 6338 website. Above left is the Denys Fisher Cyberman toy which was part of the same set as the the "Red Top" Dalek. It does not have have flat discs on its joints or pipes down its chest like the latest Revenge Cybermen. The wellingtons over the trousers and the cross-hatch on the chest unit make it obvious that, just like with the "Red Top" Dalek, the photos from that same issue of the Radio Times were the reference material used to create this toy! Another example of the influence of the Radio Times photos is the Cyberman card which came with Weetabix breakfast cereal, pictured right. Once again it isn't the Revenge type, it is the 1973 hybrid, right down to the straps over the shoulders which held the chest unit on. The artist must have used another 1960s image for reference, since the Cyberman is drawn with a gun slotted into the chest unit as per The Moonbase. Weetabix also created a Dalek card featuring none other than the Radio Times "Red Top"! This line of enquiry started out because I thought it was nice to see these monsters had a life of their own, surviving outside the Doctor Who canon. But in fact it turned out that that these unofficial hybrid Cybermen were more influential over merchandise and the television series designs than the show's own continuity. The destiny and proliferation of the Cyber-race owes a lot to the Radio Times. Gav © 2013 / Original Cyberman illustrations by Tony Clark.